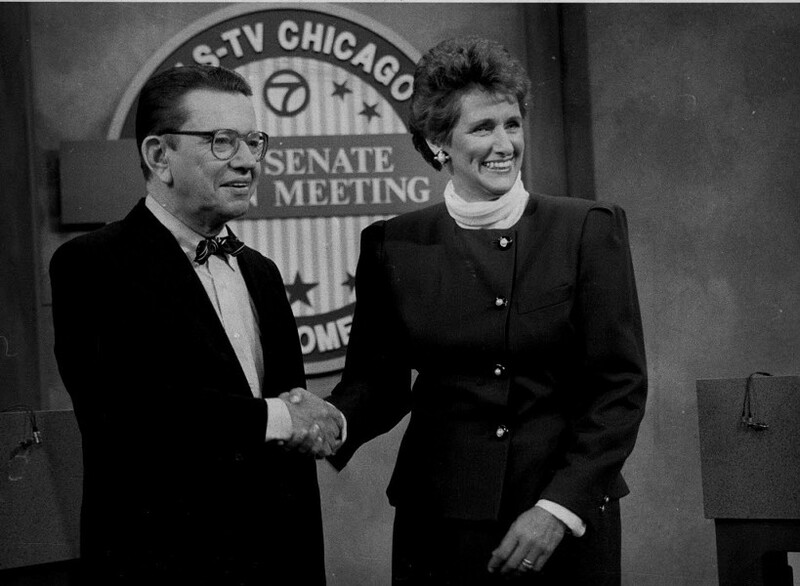 Democratic senator Paul Simon, left, shakes hands with U.S. rep Lynn Martin, the Republican who tried to unseat him in 1990. In 1988 Roger Ailes fashioned the media strategy for George H.W. Bush's successful campaign for president, and in 1996 he became the first CEO of Fox News. Between these two historic events, he came to Illinois. His fingerprints were all over a nasty 1990 Senate race between two by-no-means-nasty people: Democratic incumbent Paul Simon and his Republican challenger, Lynn Martin, a moderate congresswoman from Rockford. Ailes thought Simon, who won by a whisker in 1984, was vulnerable: arguably too liberal for the state, and after making a run for the Democratic nomination for president in 1988, perhaps not sufficiently committed to the job, in the minds of Illinois voters. So Ailes rode into town to see to it Illinois sent Martin to Washington. Ailes was already notorious, and Simon "had tremendous success raising a ton of money by using Ailes's name as a scare tactic," says Kerwin Swint in his 2008 biography of Ailes, Dark Genius. His hackles up, Ailes called a news conference. It didn't go well. "Ailes seemed to violate some of his own rules . . . " Swint writes. "He overreached. He called Senator Simon names. He accused him of lying." Ailes said things about Simon that sound ridiculous now and sounded just as ridiculous then. "People like Paul Simon are the ones who are hurting America . . ." he said. "Simon is just being Simon, which unfortunately is being slimy . . . . He has ethical problems and he gets away with it because of that bow tie . . . . He's a complete fraud." 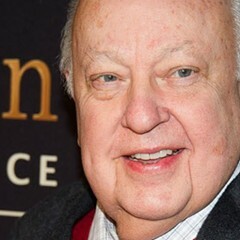 Ailes also called Simon a "weenie." I supposed Illinois voters who already believed Simon was a weenie responded favorably to Ailes's assertions. But this was a tiny choir. Simon won the election with 65 percent of the vote. Afterward, discussing the Simon-Martin race with Bryan Miller of the Reader, political consultant David Axelrod called Ailes's news conference "unprofessional and ludicrous" and the Martin campaign an "abject disaster from start to finish." Axelrod suggested that Bush's 1988 victory had made Ailes too full of himself to think straight. Ailes's current troubles with women who have lined up to denounce him (and his likely departure from Fox) indicate that being full of himself and not thinking straight are personality defects that have afflicted him for a long time. 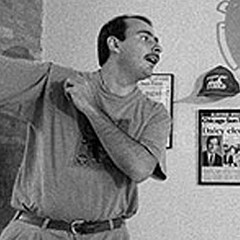 Q & A with David Axelrod, the hottest political consultant between the coasts.